There’s a good amount of information on how to SEO an article, but not much information on how to SEO an article right from the start with good old keyword research. Not the most exciting topic, I know, but one that is extremely important if your goal is to get your posts ranked on page one in any major search engine. One of the problems that many website content writers have is when they write about a specific subject, they pick keywords that are too broad. For example, in this post, if I would have chosen SEO Articles, SEO Article Writing Service or SEO Article Writing, I would have never seen the light of day in search engines. Why is this phrase so much better than the other three? Let’s find out. First off, take a look at this chart below that explains the difference in shorter more broad keyword phrases versus more natural long tail keyword phrases. These keyword phrases also tend to be much less competitive as well more relevant to the reader. When we look at the four phrases I could have chosen for the keywords for this post, we need to look at the competition, the amount of monthly traffic you can expect to receive if you are on page one of the major search engines, and how relevant the keyword phrase is for today’s search engine users. I chose this phrase because it will be easy to rank for with only 21 other competing pages. That’s assuming I write good quality content for my readers as well as apply some SEO Skills once I publish this post. And although you may be thinking, Todd, only 48 people will be coming to your website if you are on page one of Google – that’s not a lot. What you need to understand is as I start ranking for this phrase, I’ll start ranking for similar phrases that are related to my original keyword phrase: How To SEO An Article. For example, I wrote a post on Amazon Selling Fake Products, my keyword phrase was Does Amazon Sell Fake Products. And although it doesn’t have a lot of monthly traffic, I rank under about 100 different keyword phrases on page one in Google and the cumulative monthly traffic to this post is between 1,200 to 1,500/mo. Now, let’s look at the three keyword phrases that I didn’t chose. Look at their competition which is what’s called the QSR. SEO Articles: Although great monthly searches at 5,040 and solid traffic at 857/mo, the 400K+ competing pages is enough to let me know that this phrase is not good and I’ll most likely never rank for it. SEO Article Writing Service: This phrase is possibly the worst with a small amount of month searches and a good amount of competition of 332 competing websites for this phrase. Special Note: I’m using Jaaxy Keyword Research Tool for this post and I’ll explain why below, but just note that anything below 200 QSR or Competing Pages is considered relatively low competition. Obviously, the low the number, the better. 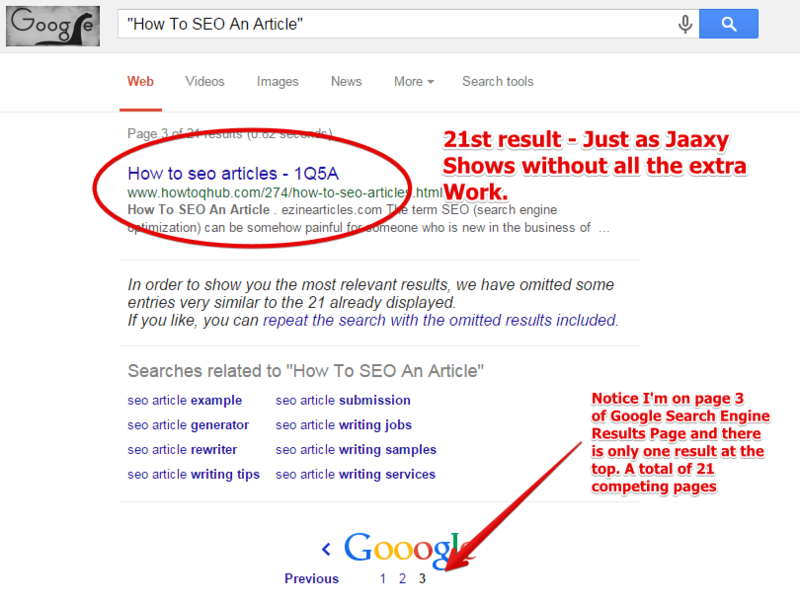 The last keyword phrase is SEO Article Writing: Again low volume, high competition, not a good keyword phrase. I’ve used the Google Keyword Research Tool and Google AdWords Keyword Planner Tool and the problem I have with them is that I find the information that they provide is not very helpful. I want to know the competition of the keyword phrase that I’m looking at. Not just a Low, Medium, High result. I also want to know the exact amount of competing websites that I’m up against. Like I said, if it’s above 200 QSR (200 competing pages), I usually stay away from the phrase, this isn’t always the case because if it’s a really good phrase and it’s below 300, I can still get to page one in Google, but it will take more time and effort. I also want to get an idea of the amount of traffic I can expect to see to my website if I do get on page one of the major search engines. Jaaxy provides me with all this information, plus my site rankings, domain names, and most importantly, brainstorming ideas for similar phrases (along with their true keyword competition) that I would have never thought of if I was using Google’s Keyword Tool and not Jaaxy. Now, I know that this keyword phrase, How To SEO An Article, has more than 10 monthly searches and it’s level of competition independent of using Jaaxy. I just put in the exact phrase, “How To SEO An Article”, using quotation brackets into a Google Search and I get just over 2 pages, 21 SERPS/competing websites for this exact phrase, just like Jaaxy showed me from the beginning of my keyword search process. What did Jaaxy have again? Let’s see. This means that regardless of whatever niche you are involved in, you can use Jaaxy to figure out exactly what the keyword competition is and find the right keywords for your website that will allow you to rank in whatever niche you have chosen. Many people think that a certain niche is too competitive, and I can respect that, it will take longer to get rankings, see traffic, and make sales if you’re in a more competitive niche, but really, with the right keyword research being completed before you publish your post, you can see how difficult or easy it is to rank using a keyword tool like Jaaxy. The other thing I would add about going after smaller amounts of traffic that are lower in competition is that if you are producing consistent quality content that is based on Long Tail Low Competition keywords, the traffic will start to pile up and you’ll be impressed with the results. Whenever I go for the big Keyword Home-Run, meaning medium/low competition, but search results in the thousands, I find it takes much more time to get to the top of search engine rankings and I usually really have to fight to get past page 2 or 3 on Google. I get just over 84% of my traffic to my website from organic searches and I use Jaaxy every time I write a post. My posts rank quickly and usually in a high position. I learned how to do this using an online educational program that covers every aspect of internet marketing and online business and I welcome you to check them out. I really hope you learned something new and now understand how to SEO an article using the right keywords. If you have any questions, come on by to LearnToGrowWealthOnline.com and let me know. Todd is a full time online marketer, avid traveler, Occupational Therapist, and currently lives in Medellin, Colombia. He strives to help people make a better life through self education, determination, and following their passions. Connect with me on Twitter | Google+ | Facebook | Go to my blog to learn more about me! I agree that it starts with Keyword Search, a valuable and high return activity in the search marketing field that can make or break your website. It all begins with words typed into a search box, thus it’s important to focus on the right keywords. The picture shares a very informative lesson how the keywords that are easy to rank and hard to rank varies, and also attention-grabbing that short keywords Phrases have the highest competition. What’s interesting here too is the subtopic about “The Problem with Google Keyword Research Tool” newbies should also real about it and comprehend to carry out an effective line of attack. All in all, it’s vital to not only understand the demand for a given term or phrase, but also the work required to achieve high rankings. Thanks for your kind feedback and insight on my post, How To SEO An Article. 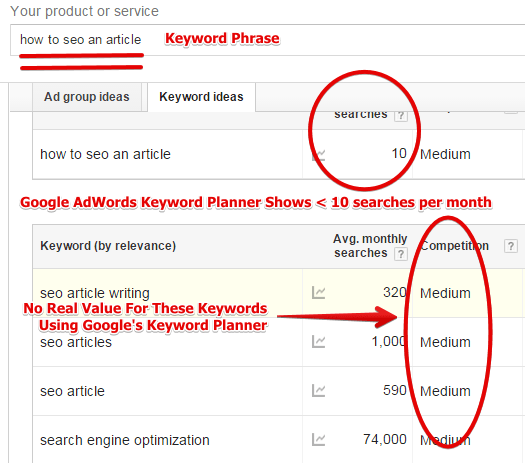 As you can see, keyword research is one of the KEYS to understanding how to rank one’s posts. And really is essential to start the process. I’ve heard some internet marketers say to do your keyword research after you write your post, and the reason why some feel this way is so that your content is the focus and not your keywords or doing such silly things as keyword stuffing. Personally, I like to have my Long Tail Keyword Phrase in my mind before I start writing, but I also like to have a little outline to stay focused on what I want to discuss in whatever post I write. Regardless of your preference, targeting a specific keyword phrase and creating quality content that is based on, or is designed for, your niche audience will be the key to achieving top rankings. Thanks for sharing this lesson. I was never a keyword expert when it came to my posts, but I did learn something here. A lot of bloggers in the past have taught that you should use low competing keywords so you can start ranking for them, but the problem is that most people didn’t know how to go about doing this. Keyword Planner was some help, but from what I see compared to Jaaxy it was pretty generic. If 84% of your traffic is from organic search by itself, then that’s another great add on to your strategy. We all can definitely use a program that’s of value like this! Thanks for your feedback on the post and I’m glad you were able to benefit from seeing how easy it is to use Jaaxy to perform keyword research in order to SEO an article before you actually post your articles. It really does make a big difference. Now obviously, quality content is always king. But having a good understanding about what people are searching for in whatever niche market you’re in is critical when you are putting in a good amount of time to create your website posts and pages. Before I was introduced to Jaaxy, I was writing posts based on what I thought people were searching. Most the time I was correct that a lot of people were searching for a specific concept or keyword, but with no understanding of the keyword competition, my posts seldom ranked. Even though I felt I was writing quality posts, the competition was so fierce that it never would matter, my posts would never get ranked under the keywords I was using. But using Jaaxy, it’s easy to see what people are searching for in today’s market and then also see the competition of the keyword phrase. As you continue to use this method and see your posts rank faster, your website also gains more authority and this then leads to increased ease of ranking for other posts, kind of a snowball effect. Thanks again for your support and taking the time to share your perspective with everyone. I came here from Sherman’s roundup post. This is absolutely an impressive keyword post. I signed up to Jaaxy before but didn’t really exploit it. I’ll have to go back and see how it can help following your instructions. Thanks for your comments and feedback. Yeah, I would definitely give Jaaxy another try. It has numerous helpful features besides finding keyword/keyword phrase competition. You can also find affiliate programs, domain name availability, and site rankings with a click of a button. If you’d like to read more about the features, you can check them out here…. wow! excellent article, I think keyword research is a core part which we need to perform before article writing, this process define article position which we can get into google search engine. if we perform good keyword research and use long tail keyword then absolutely we can easily get best result thanks so much for this informative article. Thanks for your kind feedback on the post. If you have any other questions or would like to see more about writing content, coming up with content ideas, check out this post…. Great post there. Keywords are one of the most important and first step of SEO. I personally prefer to target long tail keywords when I am working on a long term blog as I don’t have to waste my time in building links for it. Rather than this, everything you have mentioned above is just awesome. It’s such an informative post. This was a very Informative Post. As you said that Keyword Research is one of the most important factor that one should take care before writing an article. Also after writing the content one should share it as much as he can and also making backlinks is very important in order to rank for the keyword you researched. Looking forward to read more posts from you. Its cool learning about Jaazy. This is my first time of learning of this tool. I always appreciate any tool that will provide value and make my Internet marketing easier. I guess this keyword research tool falls into that category. It would be cool know how this tool helps me get better site rankings. From this review, since it is addressing real analysis of the competition, its sure an awesome tool test for keyword research! I’m glad you found these tools and information helpful!! Todd shared some great knowledge here, for sure! When it comes to SEO and keyword research, you are always learning new things, and finding new tools to help you with everything! Keep up the great work, Sunday!